Over the last 10 years he’s worked on organic marketing in various settings, including email marketing and SEO for apps. The MobileDevHQ is an App Store optimization product. App Store Optimization (ASO) is different than SEO because app stores are different. ASO also includes: Top Charts, icons, screenshots, ratings, reviews, etc. Like SEO, the best ASO is a full, well-rounded marketing strategy. 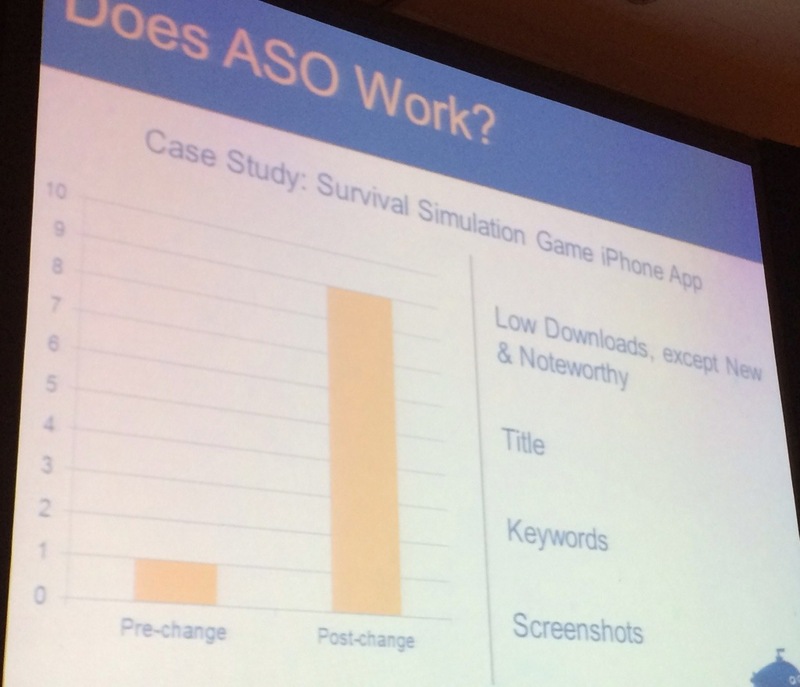 Here’s an example of a game app that optimized their title, keyword and screenshots. 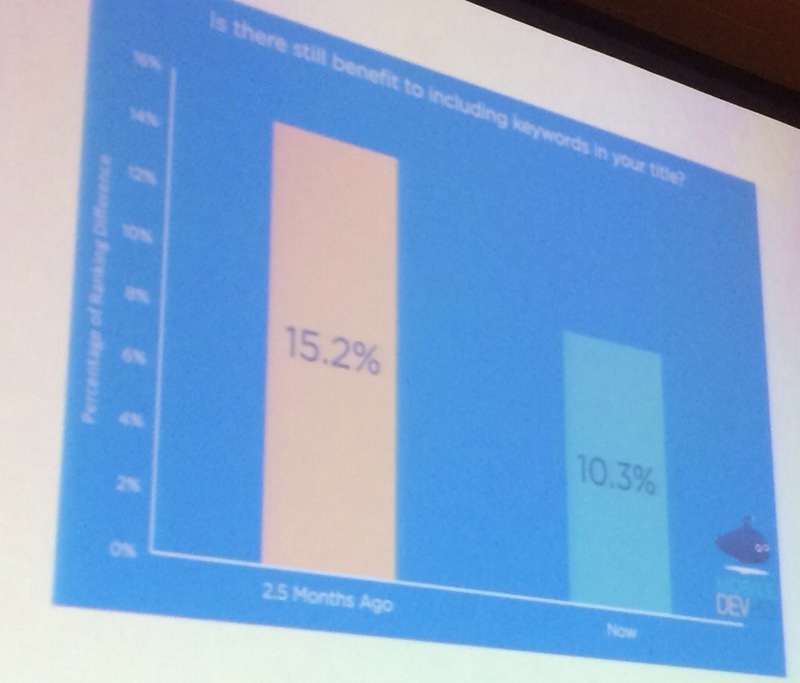 In this non-game example, simply focusing on more targeted keywords and moving away from head terms saw 4x more downloads. Text in reviews is being counted (lightly) in rankings, they have found. Links to your app will effect Google Play apps but not iOS. He expects that Twitter may come into play soon. He believes that Google+ signals affect Google Play store rankings today. There’s a cultural difference between iOS and Google Play. iOS: media world (there’s a title and a rating). Google: constant iterative refinement, big data, graphs, come from the web, use and know how to use many signals. He believes this will put Google on top in the long run. Videos are your friend. Videos are integrated into Google Play App Store. They tell the story of the app which is powerful when you only have a few screenshots to tell the story otherwise. Google App Indexing: Android users search the web will be able to open apps from links in browser. There are more apps created outside the U.S. than within the U.S. today. Angry Birds is developed by a company in Finland. Cut the Rope in Russia. SwiftKey in the U.K. If you’re an app developer in a small company that doesn’t have English as your local language, then you have to take care to think about who the geo market is for your app. 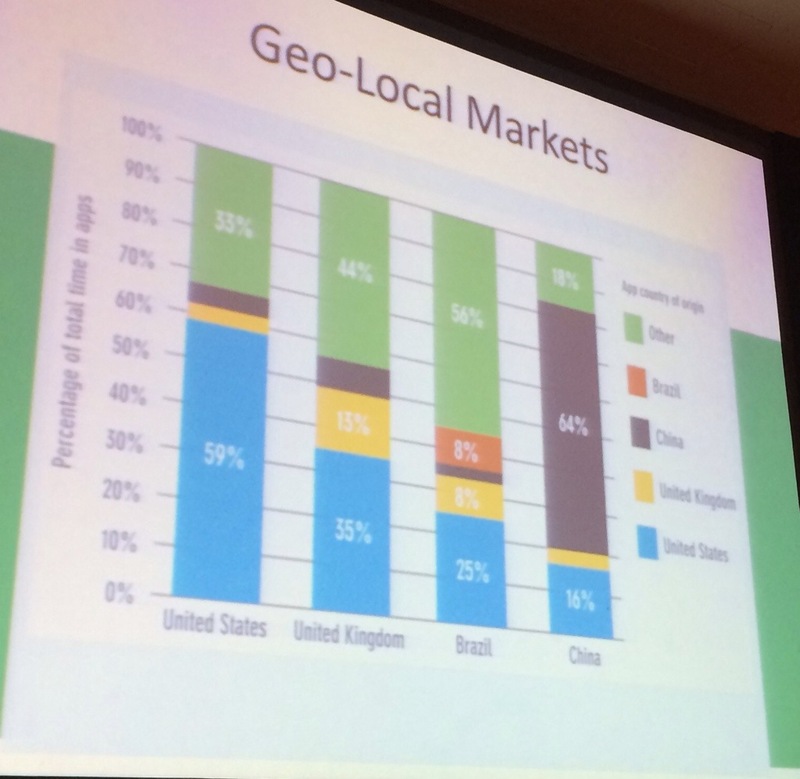 8 out of 10 of the largest mobile app markets don’t speak English primarily. 1. Localize your App Store listing: title of the app, developer name, description, content on the listing page. Closely monitor downloads for the associated languages and countries with that region. 2. Localize the content of the app. Translate the in-app language to the language of the region, working with a translation company or an expert in the language, not just pouring the text into Google Translate. 3. Invest in the location with a local team. Highlight your local optimized app in your marketing material. To fully support this audience, develop a local time to localize your company website, your social media promotion, your customer service support and your user acquisition strategy. 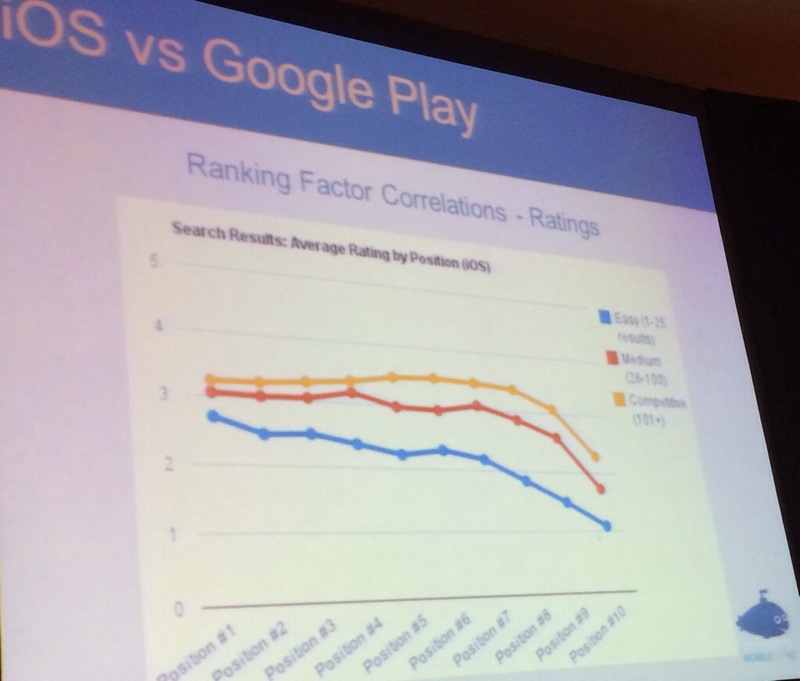 Mobile hasn’t cannibalized desktop search overall. There are limitations in the App Store. There’s limited editorial shelf space and very little exposure. An editorial, categorized approach to the web is not going to work long term. 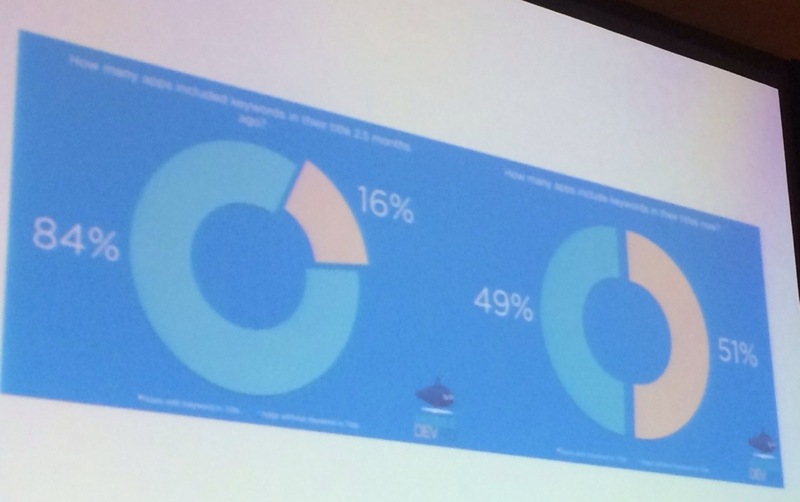 Top Charts are influenced by spend/paid traffic. The search in App Store is very basic – title, descriptions, keywords. It takes a few minutes so what’s the next step? Paid advertising. This shows the diminishing returns of ASO. 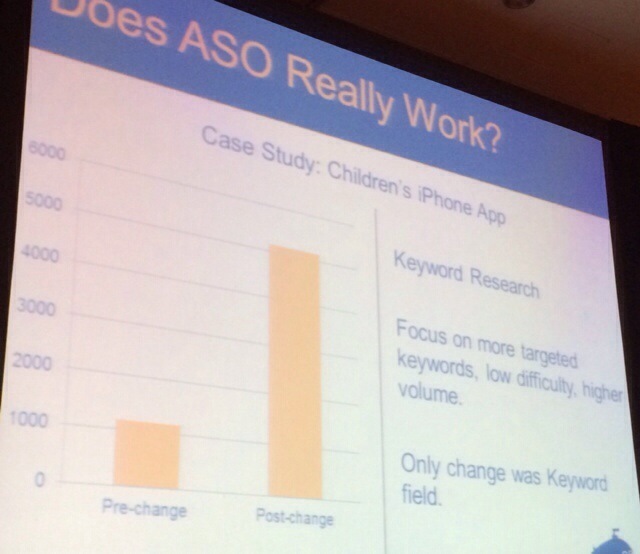 The competitive advantage of ASO is reducing as more apps leverage keyword targeting. This will stay true until app search becomes more innovative as will probably be ushered in by Google. And the results from that ASO became less effective as more people employed them. 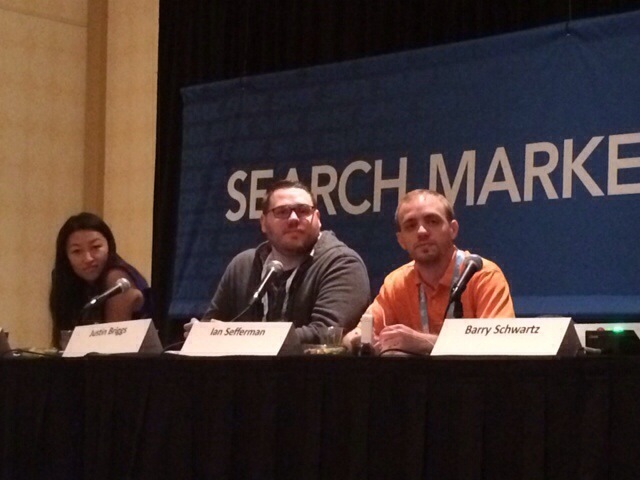 Opportunity: leveraging web search to drive traffic to the App Store. Web and mobile app channels don’t work in isolation from each other. Marketing in one channel drives results in another. Most apps lack a dedicated landing page. He saw a doubling of revenue for an app YOY by making this change. Be careful of 12-month averages reported by app optimization tools; look at seasonailty and trending of terms that may be hidden in the raw data. 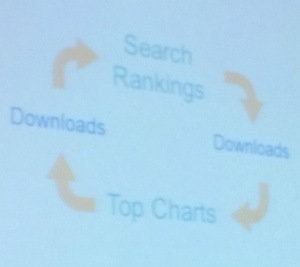 Rankings shift from downloads (spend) to links (content and outreach). SEO fundamentals include: PR, events, game reviews, blogger outreach and contests. This kind of basic promo work can allow you to dominate markets. nice Inforrmation.I will just make use of this usefull tips and make changes right now.